Update: Plumas County District Attorney David Hollister is charging Karen Schwamb, 48, of Twain with three counts of murder, and one count of felony driving under the influence of alcohol and drugs and causing injury with a prior conviction. The charges stem from the Feb. 5 collision in the Feather River Canyon that resulted in the deaths of Thomas Fridrich, of Belden, as well as John Lowe and his fiancee, Crystal Smith, of Paradise. Schwamb’s Feb. 7 arraignment was continued to Friday, Feb. 9, at 11 a.m. She is being held on $3 million bail in the Plumas County jail. Update: Karen Schwamb was rebooked at the Plumas County jail on three counts of murder Tuesday afternoon, Feb. 6, with bail set at $3 million. 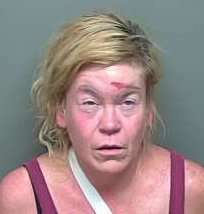 She is due to be arraigned in Superior Court on Wednesday afternoon, Feb. 7. She should have to be in prison for the rest of her life, and she should have to see pictures of the three victims she killed before and after for the rest of her life for 23 hours a day..
‘Under the influence’…was it recreational marijuana? Three hours of watching these poor people being pulled from their wrecked vehicles…what a waste….absolute waste. Kiss your loved ones…hold them tight…always tell them how very special they are. Didn’t you say the same thing on your last post on the previous story ?! I don’t think she’d have been trying to pass if she’d been smoking. If it was Marijuana it wouldn’t have happened!! You don’t know how this drug is saving people that have many different ailments. It is helping to get them off more serious drugs like Hydrocodone & Morphine. And the Big one maybe curing cancer!! My heart does go out to all involved. It should not have happened. They women was breaking the law in so many ways. wrong… there has been many dui accidents directly related to weed and nothing else in the peoples system.. they had one a few years back just outside reno where a kid high on weed t-boned a mini van killing a family. weed is a good thing but don’t act like its ok to be on while driving. The father of marijuana legalization, Donald Peron, just died of lung cancer on January 27th. The American Heart Association, the American Lung Association, and the American Pediatrics Association are all against marijuana smoking and legalization, but why bother with facts backed up by people with an education in health that are sober? After all, you can get your “facts” from Leafly and the Cannabian and I’m sure they don’t have a dog in the fight. Pardon me if I don’t believe the asinine assertion that marijuana is a wonder drug. Take your beef elsewhere Sherry Gee. Three people have died. Show some respect. I’m sorry R Nelson but what in the hell does it matter what kind of drug or alcohol she was using she killed 3 people. 35 years ago I drove down from the lake after smoking marijuana and to this day I don’t know how I got down to town so yes it most definitely does impair one’s driving. Also it does NOT get you off pain medication, if you are in pain then you are in pain and should have every right to take them the problem is all the people who crush and smoke it along with other crap their taking and this is why there are deaths over it. I have no problem with marijuana per say however smoking marijuana, taking pain meds, drinking no-one should be driving while impaired. Go on a quit with that refer madness. This was my cousin & his beautiful fiancé on the motorcycle. My heart is breaking for their families. They leave behind a wonderful family who is going to miss them desperately. I have no words for the grief I’m feeling. Hold your loved ones tight and like you said….tell them how very special they are to you. Life is so fragile. Your words are well received…. life is so fragile and we should all be conscious and grateful for every moment that we have with our loved ones! Why would someone ask if it was recreational marijuana? Does it matter? What a horrible loss. My heart goes out to everyone affected by this tragic loss. Because if things like this happen because a drug was legalized it just shows how stupid voters are! Solve a drug problem by making it legal? Get a grip. Authorities need to know, that’s why! She was drunk I know the people who were on the scene, how dare you use this tragedy to point your finger at your prejudices. Alcohol and bad desicion making are to blame, not people voting for a plant that’s proven to be114 times safer then alcohol. Ignorance. Like alcohol?! Lol that’s a no brainer. It was my family that were riding the motorcycle. They were returning from Reno after getting married. We are heartbroken. You Sponge Bob need to stop using our loss to your advantage. This murderer was drunk on alcohol and chose to drive. Period! Marijuana had nothing to do with it. OH MY GOD, WHY NOT SAY ITS TRUMPS FAULT. THIS PERSON HAD ISSUES THAT SHE CHOSE TO TRY TO RESOLVE BY SELF MEDICATING AND THIS ISN’T THE FIRST TIME. MAY SHE GET THE HELP IN NEEDS WHILE SPENDING THE REST OF HER LIFE DEALING WITH THE DESTRUCTION SHE CAUSED. You probably voted for Trump, didn’t you? If it were recreational marijuana she would have been much more likely driving UNDER the speed limit. Traffic fatalities went DOWN in areas that legalized marijuana. Learn the facts. Also, just making something legal versus illegal does not stop the consumption of the substance. Open a history book and read about Prohibition. So sorry for your loss! 🙁 Praying for you all! Too much controlled substances in the sierras. Period. Many people there look so strung out. So many tweekers. At the stores and gas stations. Meth and heroin abound. Truth be told though, alcohol is statistically the worst, most used, and most dangerous. Wow yeah the problem is here in the sierras cause all the opium fields are here right? Jesus yes there’s a horrid drug problem do any of you know why? Well about 7 years ago dr’s in this small area were putting every patient they could on Opiats then they cut the entire population on meds off. Then and not until then heroine showed up here. Coincidence? No hand in hand and the only reason it’s a problem is because they don’t care if you become an addict hell they want you to believe your child needs meth to go to school if he/she might be overactive! Maybe instead of pointing the finger at the victims you should think about what made them get that way in the first place. Herion was here long before the Drs. cut off opiate prescriptions. I’m so sorry for your loss. Praying you’ll be comforted in this time of such senseless unecessary sadness. Tragedy ! I drive that canyon for a living, I dodge rock falls, land slides, falling trees, raging waters and out of control drivers ! I pray for all involved. I pray that the 3 victims knew Jesus as their Lord and Savior, so they have the assurance of heaven. Please don’t let friends drive under the influence of ANY substance. And if you haven’t accepted Jesus as the Lord,and leader of your life, do it now!!! Jesus loves you and forgives you. He is the answer!!! The losses here are so profound. My heart goes out to all involved. So many lives have been affected. So sad. Just FYI, this woman was not a Twain resident. She was a visitor to the area, camping and mining. Nothing more. She has ruined so many life’s. Such a tragedy. People using this article as a forum to promote pot? My cousin John Aaron Lowe and his fiance Crystal Smith were killed in this crash. Yes, her boyfriend was in the vehicle. This woman WAS NOT FROM TWAIN. She was staying in an RV here for only a couple of months. I’ve driven the Canyon everyday, five days a week, every week, for the past two years. From Quincy to Chico, where I work. The canyon is not dangerous unless you make it dangerous. You would do this by-going 80 MPH, passing on a double line, passing on a corner, or driving under the influence of anything (except Marijuana-if anything they are going 10 miles below the speed limit). I’ve dodged many rocks, deer, and even a few bears. It can be driven at 55 MPH all the way, only two corners that you actually have to slow down for, and not even brake, just take your foot off the gas. People make it dangerous, the road is not. The only thing that scares me when driving highway 70 is other drivers. Pay attention to the road, its not hard. Its tragic how things like this have to happen before actions are taken. I’ve been passed on highway 70 many times on double lines, and it’s only because there was no place to pull over, and not a turnout or passing lane for miles. People get annoyed when following someone who brakes on every corner, this causes road rage, and then they will pass when its’ clearly not safe. If a car catches up to you, 10 times out of 10 they are going faster than you. Pull over, let them go. Don’t tailgate me, because I won’t tailgate you. Treat drivers how you want to be treated. In this case, nobody knows the facts, unless you were there, but its clear that speed and ignorance were involved. DUI = Driving Under the Influence of “something”. Just like alcohol, driving stoned/high on weed or prescription meds. Its all the same, in the eyes of the law. There are SO many variants of level. How long since last time, how much, and yes, your tolerance level to certain things. But tolerance levels and blood level numbers differ. In the eyes of the law it the numbers, plain and simple. Good people got killed. Nobody to blame but someone that decided it was okay to be under the influence of a substance and drive. Some people drink responsibly or do drugs responsibly. While others choose to infringe on the rights of others. It’s not the drug or the drink. It’s the person who chose to do the act. The most important thing here is the fact that more lives were taken. Good lives too. It’s not fun scraping bodies off of a street, but when people get pulled over for drinking/substance abuse while driving they get angry. This is exactly why any substance abuse and driving is a crime. Condolences and respect to those families all involved. Too bad she survived the wreck. I say wreck because she chose to drive drunk, this was no accident and instead of getting off easy, there needs to be very stiff consequences for repeat offenders. This is horrible for the families and so very sad. My young brother drank himself to death in October. I can’t count the times he drove drunk that we didn’t know about. We always tried to make sure he didn’t. I Thank God he didn’t kill anyone during his decent into alcoholism. Prayers for the families who lost their precious sober driving family members. I smoked maryjane and drove everywhere without a problem for 30 years. But drinking and driving is another story. I used to drink and drive for 25 years, and had a few minor accidents, a lot of near misses, and a couple of arrests. The crazy woman trying to pass on a blind curve at 80 mph is foolish for doing such a thing. I’ve never done something like that drunk or not. I pray for the victims souls that they were saved. I drive clean now and have many years, that’s the way to go. I met Karen when I was about 13 and that was 30 years ago. I grew up with her nieces as if they were my sisters. Its a tragedy for those that lost their lives – as a parent it chills me to the bone to think of anything close to the pain their families are going through right now. I also feel for Karen’s family who are some of the most loving people I have ever had in my life. My thoughts are with those that have to live with the pain of lost loved ones and also with those that are sisters, brothers, and nieces of the one that caused this terrible event.